Dimensions: 144.00”L x 108.00”W x 72.00”H. Colors of the bouncer may vary! 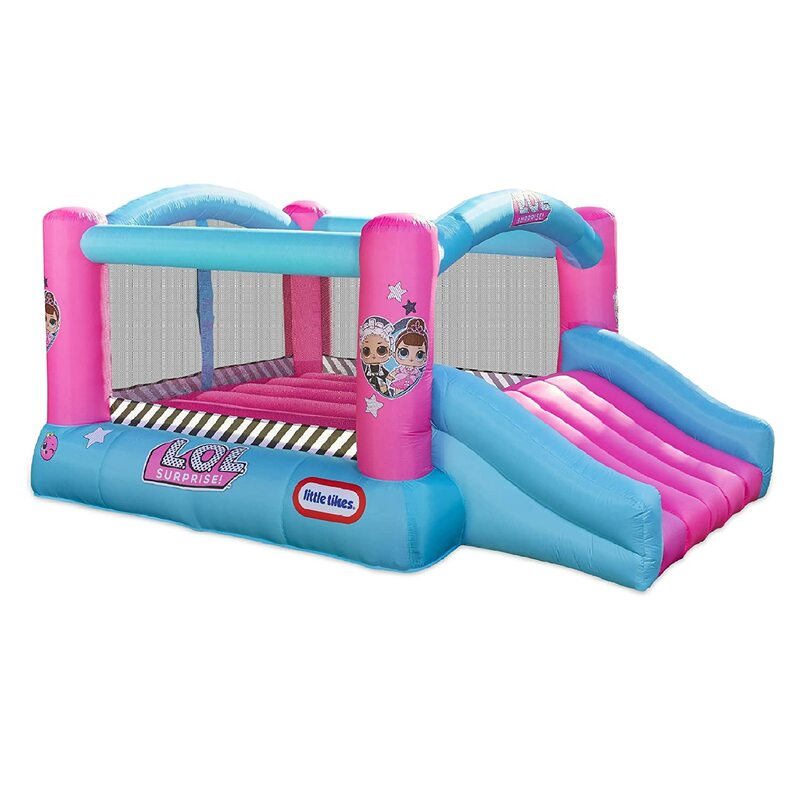 ENDLESS SLIDING& Jumping FUN – There is a inflatable slide connected with the jumping area. Your children will love sliding out of the bouncer and getting in to jump again and again. Large jumping area offers them wide space to jump together! SWEET ACCESSORIES – A repairing kit containing stakes, Oxford materials, glue, one carrying bag for conveniently take on-the-go are all in the package. 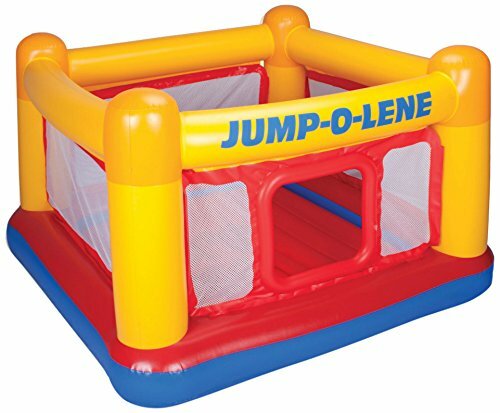 Product dimensions: 10′ 6″ L x 9′ W x 6’ 2″ H. Main jump floor dimensions: 7’ x 6’9”. Side room area: 3’6” x 6’9. Box dimensions: 20 x 20 x 24 in; 53 lbs. / Max capacity: 3 kids or 300 lbs. 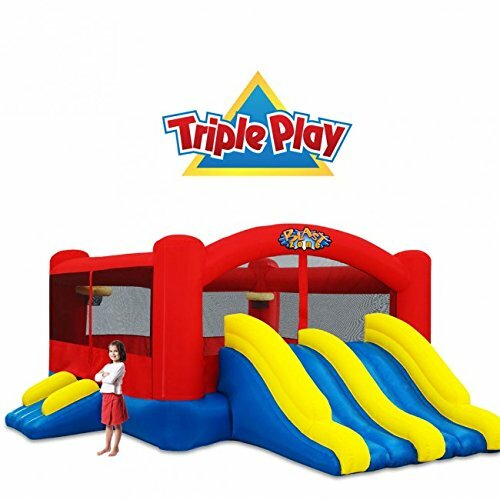 The Triple Play Bouncer and Double Slide Combo TRIPLES the fun, for party time on a level never before seen in residential bouncers! This Massive moonwalk measures in at 13.7′ wide, 16.7′ deep, and 7.1′ high (approx). This means it’s low enough to clear standard ceilings, but fits comfortably in indoor and outdoor environments. 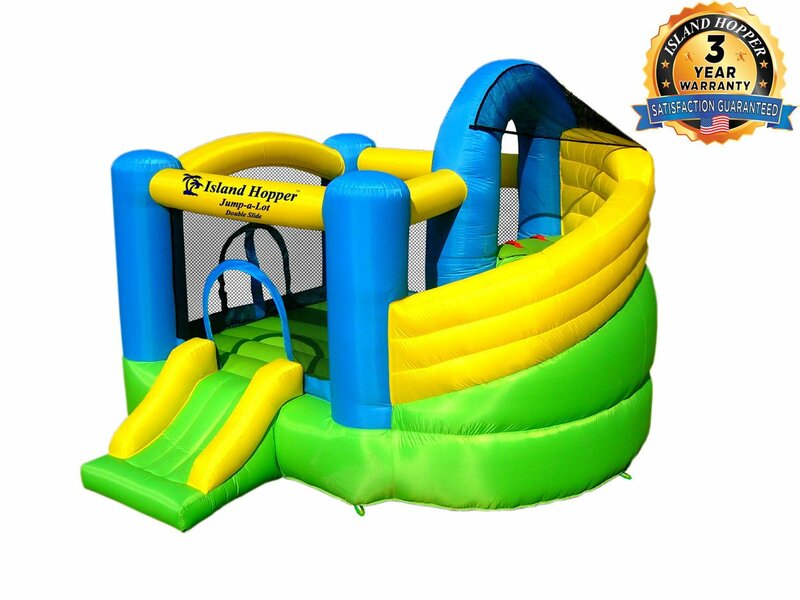 Up to 7 Kids can play with this awesome combo, bouncing in the massive jumping area, playing hoops with optional play balls, or racing down the slides! 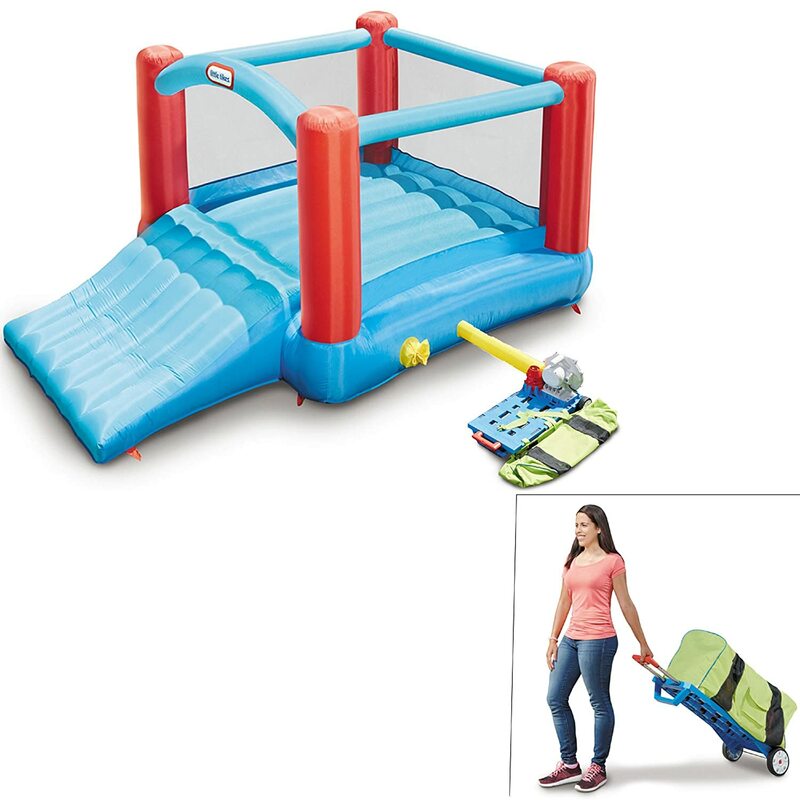 This ULTRA combo includes a 12×12 Bounce Platform (approx OD), a double racing slide, and Dual Basketball Hoops. Safety netting encloses the full jumping area, keeping players safely enclosed at all times. 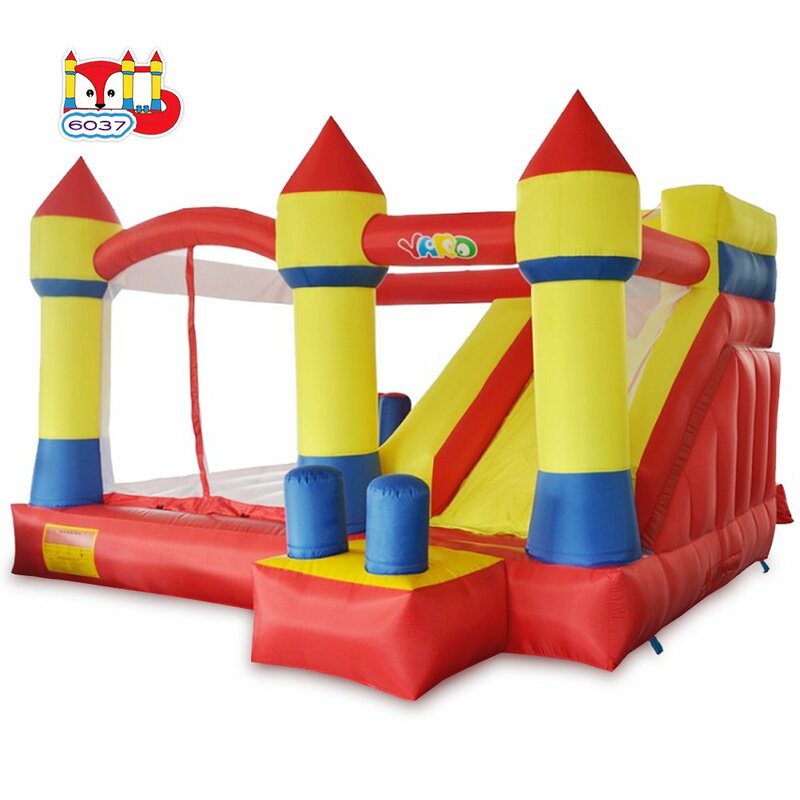 And like all Blast Zone ULTRA inflatables, the bounce floor and slide are constructed with commercial vinyl materials, and dual reinforced for long life. Blast Zone uses a unique method of construction on the Triple Play which expands the jumping area buy 25% over other bouncers of the same size, so you geteven MORE play area! What Do I get? This Kit Includes: Inflatable Fan w/ GFCI Carrying/Storage Case Step-By-Step Instructions Repair Kit Features: Dual Commercial Vinyl Slides Commercial Vinyl Bouncer Entry Ramp Dual Hoops Full Heavy Duty Netting Included Fan Carrying Case Polyester Oxford with commercial vinyl impact surfaces Approximate Dimensions: Total Footprint: 16.7 Deep x 13.7 Wide x 7.1 high Bouncer OD: 12×12 Capacity: 7 Players About The Blast Zone “Ultra” Line The Blast Zone line of Ultra inflatables takes our most popular Home-Use inflatables to the Next level. Each Blast Zone Ultra Inflatable is based on inflatables that have proven themselves with years of fun, safety, durability and quality. 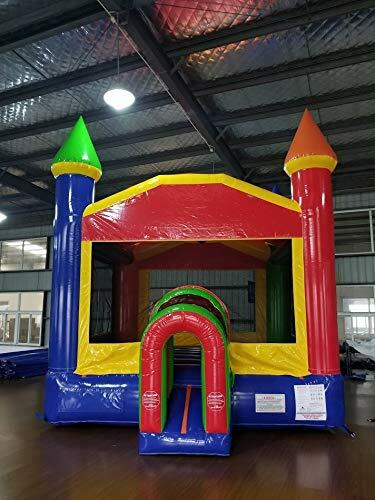 We have taken these inflatables and made them BIGGER and BETTER, adding additional features, designs, reinforcement and more commercial grade materials. MACALEAN Inflatable Twister Slide Bouncer with Blower/MACALEAN Inflable Tornado con Tobogán, motor. FREE SHIPPING IN US • Dimensions: 11.5 ft (3.4 mts) Large x 10.5 ft (3.2 mts) Width x 8 ft (2.4 mts) Tall. • Max occupancy: 5 childrens – Ages: under 10 years old • Blower included 680W • Inflate time: less than 2 minutes • Max Weight/User: 80 lbs • Recommended Age: 1+ Product Description The no commercial-grade MACALEAN is a inflatable bounce house with slide. A capacity of 5 children (80 pounds each, 600 pounds total). 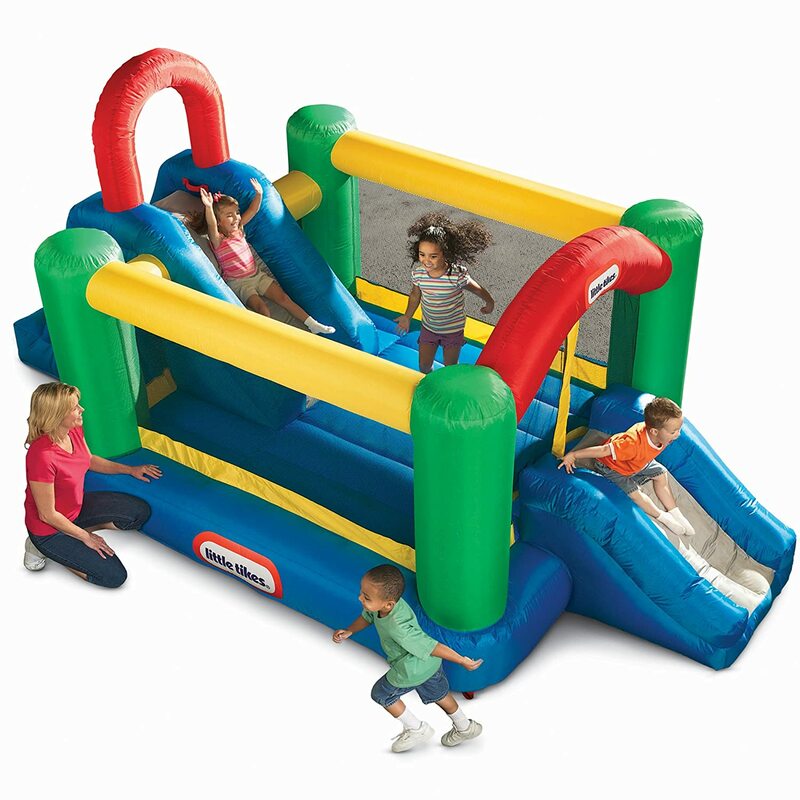 The inflatable has jumping area, slide and cIimbing area. Our bouncer is constructed from Nylon and PVC vinyl, 16 ounce (0.4mm). The jump area, slide, handrail and climbing is PVC 0.4mm for strength, being strong use. The other areas are made of Nylon. Areas of high-stress are also reinforced especially for greater use. It has sleeves for inlet and outlet air. Additional, extra reinforced seams (duty stitching) in areas of much movement (stress points). MACALEAN´s materials are high-quality, fire-resistant and meet the requirements of Lead Free Toys Act. What includes? Macalean products include the inflatable, repair kit, bag charge, ground stakes kit and blower 680W Watt, and with on/off switch. You can expect from our inflatable? You will have the best fun for children. Anywhere you use the inflatable, children enjoy a healthy fun, safe, shapes and colors that will make your magical and unforgettable games. Safe and use equipment that will allow increased protective measures. Quick and easy installation. Also the saving process is simple. The best gaming experience. Recommendations: Never use in windy or other inclement weather. Always use safe electrical installations and equipement. Ckeck before installing. The engine should always be in dry places. The inflatable must be kept clean and dry. Use only soap and water for cleaning, but it must be very dry before storing. REMEMBER: Our products have warning in English and Spanish. We can also offer our service in both languages. 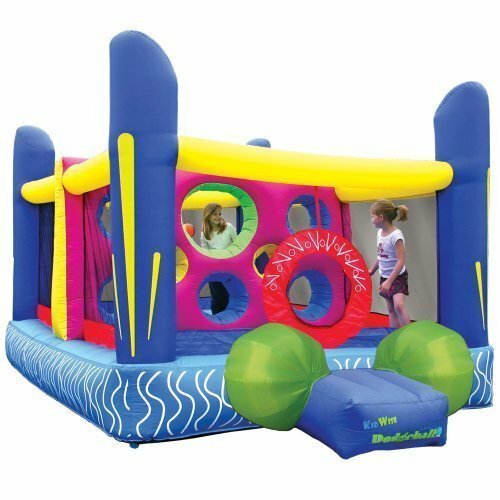 Large Bounce House for Kids: Inflated size 18.8’Lx9’Wx7’H, inflatable bouncer combo with a big slide, a climbing wall, two tunnels and two obstacle. 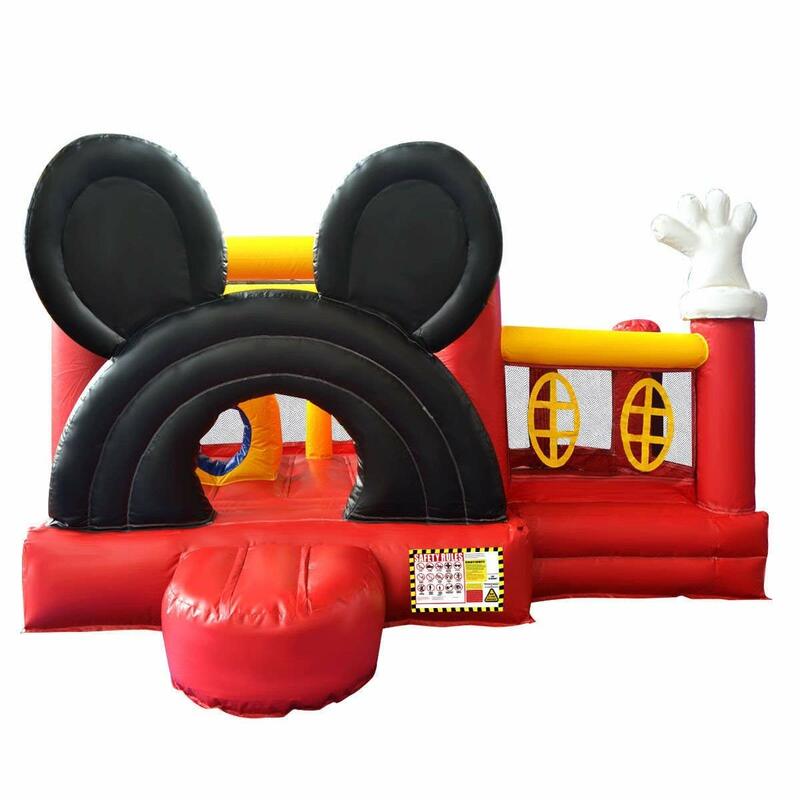 Bounce house is made by extraordinarily heavy-duty puncture proof 420D Oxford materials, while the bouncing area is made by exclusive 800D Oxford to strengthen its ultimate durability.NO WORRY that excessive jumping will lessen its service time. EASY TO USE & INCLUDED POWER SUPPLY – Easy set up, take down, and it inflates in minutes, powered by the included constant flow electric air blower, our finest commercial-grade blower optimized for rental use. 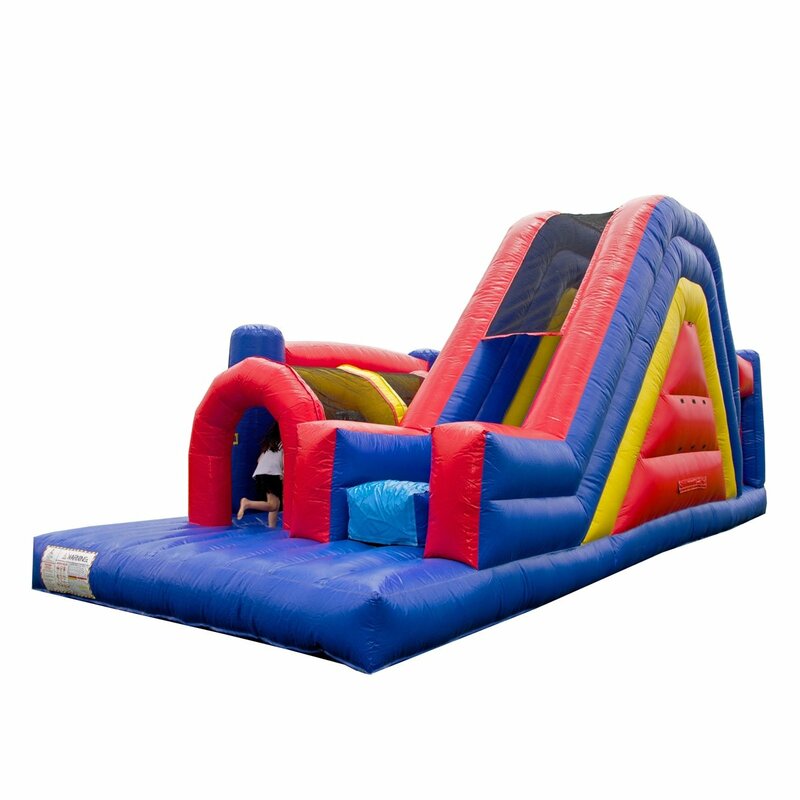 Big slide and huge area for extra playing space (10.8x 9.2’) providing large enough space to accommodate 5-6 children under total 550 pounds jumping on the inflatable bounce house. 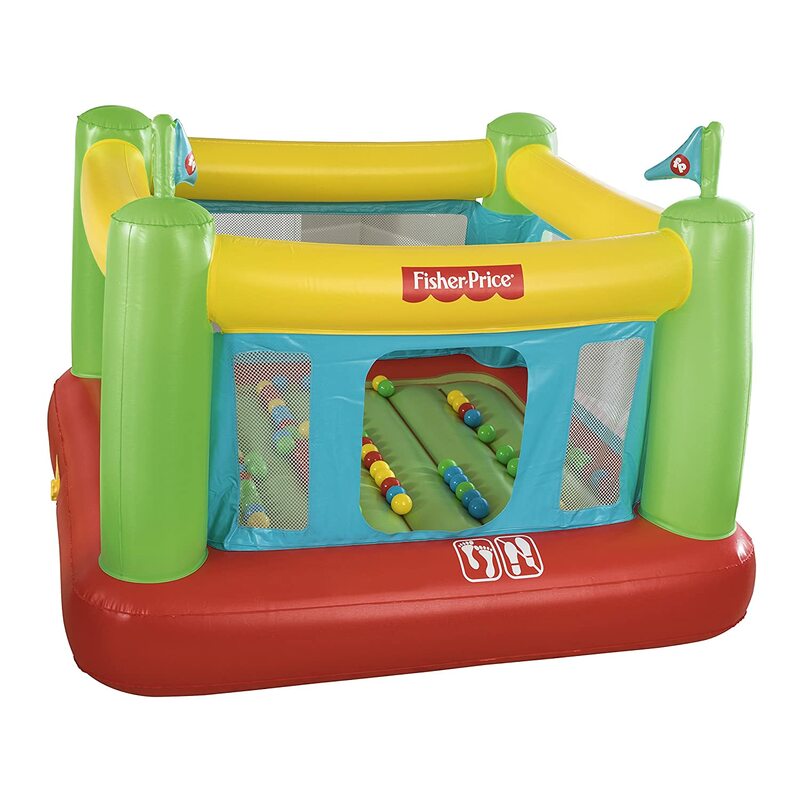 Your kids will have so much fun with the Fisher-Price Bouncetastic Bouncer. 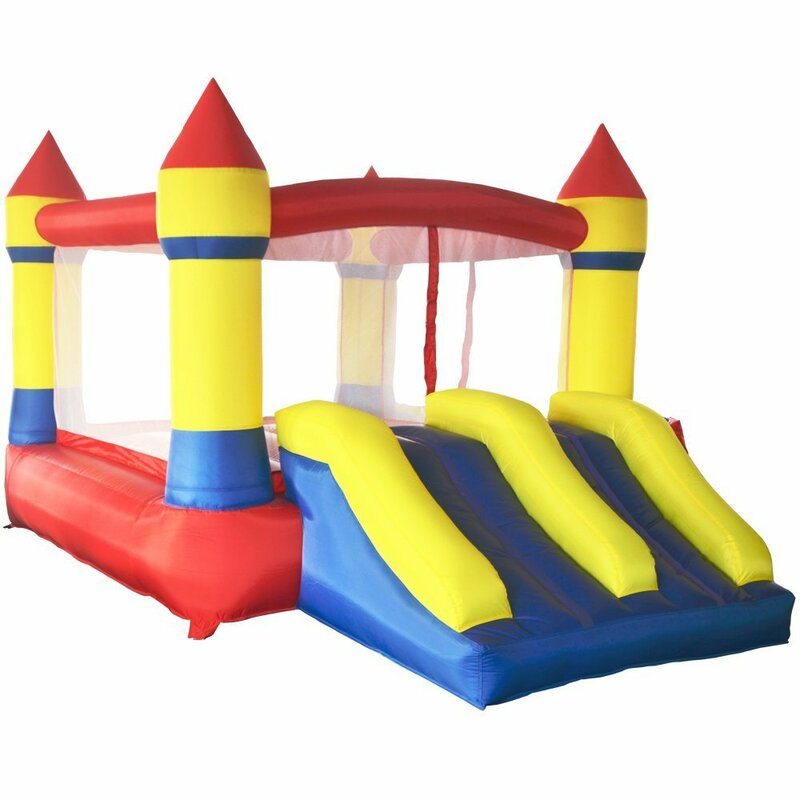 This inflatable bounce house is great for parties, as well as for everyday use. It encourages kids to get up off the couch and be active. Its removable protective walls keep them safe and have an opening for easy in/out. Indoor use only. Weight capacity, 188 lbs. 69″W x 68″D x 53″H. PVC. For ages 3 and up. 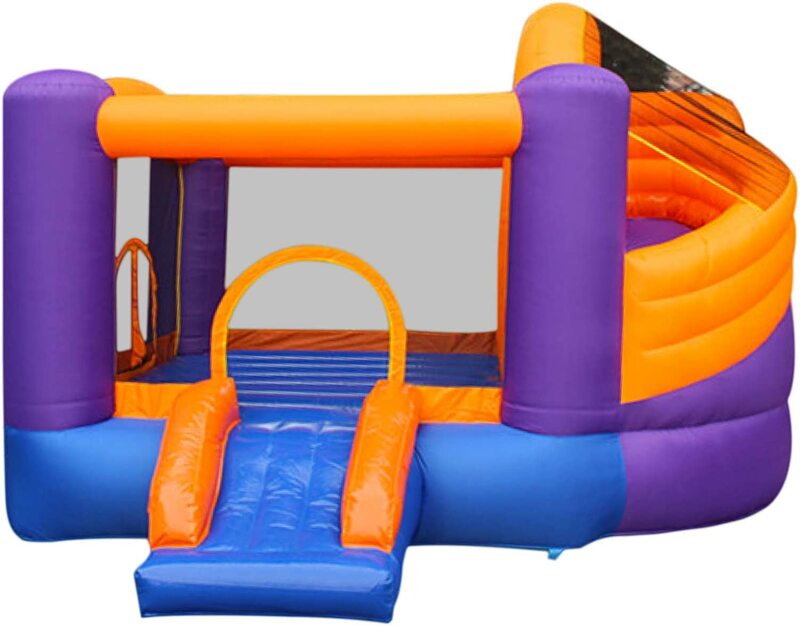 JumpOrange’s latest addition of inflatable obstacle courses is 30′ Xtreme Rainbow Obstacle Course. Compact 30′ long design with open air structure to allow comfortable space for all and provides tons of fun along its path to bring joy to every kids. Rainbow archway welcomes riders into its wonderland to explore more fun, maneuvering around horizontal and vertical pop-ups obstacles. Challenging riders to push through a wall of inflated columns and crawl-through tunnels to race up the climbing wall and slide down to finish game. Whoever racer first reaches to the destination is the winner in obstacle course game. Above overhead netting is designed to prevent riders jumping from the top to ensure kids safety. JumpOrange guarantee you to set this unit at any event is sure to attract attention and to satisfy every participants. 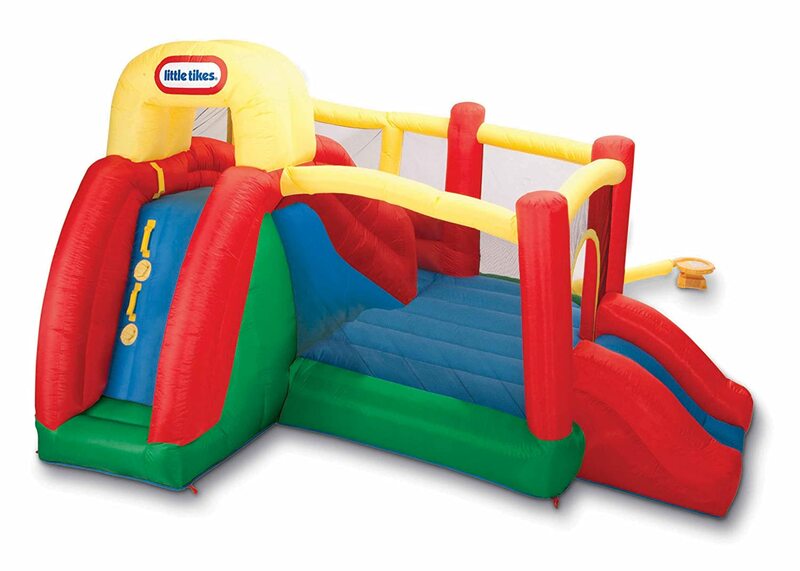 The Bouncesational Bouncer is the everyday recreational bouncing destination that kids dream about – and parents too. 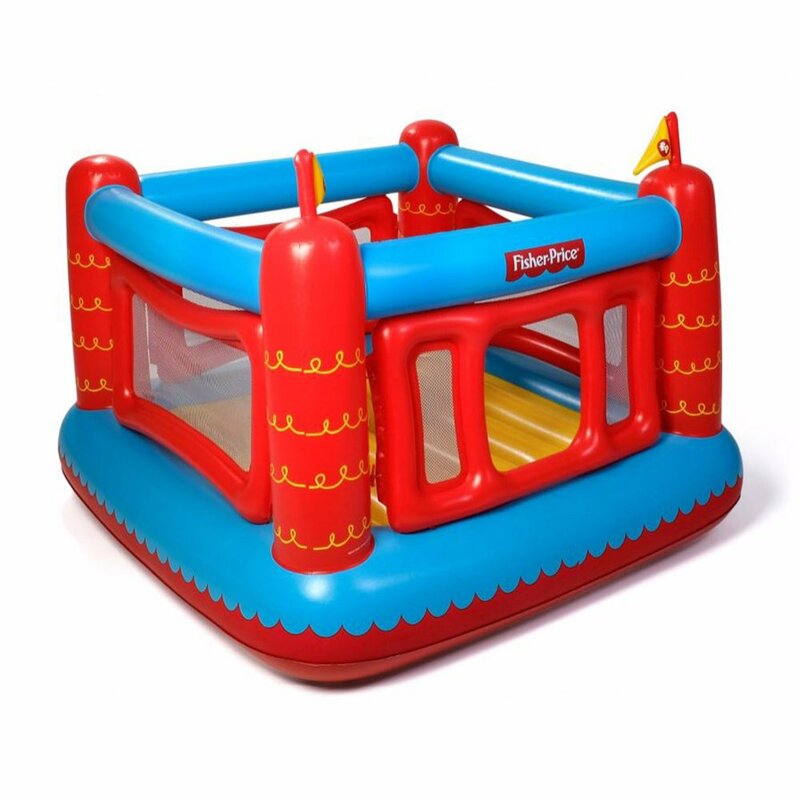 This inflatable bouncer features a built-in pump, a luxury for bouncers and a feature that saves parent’s time. Just plug the bouncer in and watch it inflate in just four minutes. Once inflated, watch your kids laugh and bounce off all that energy! 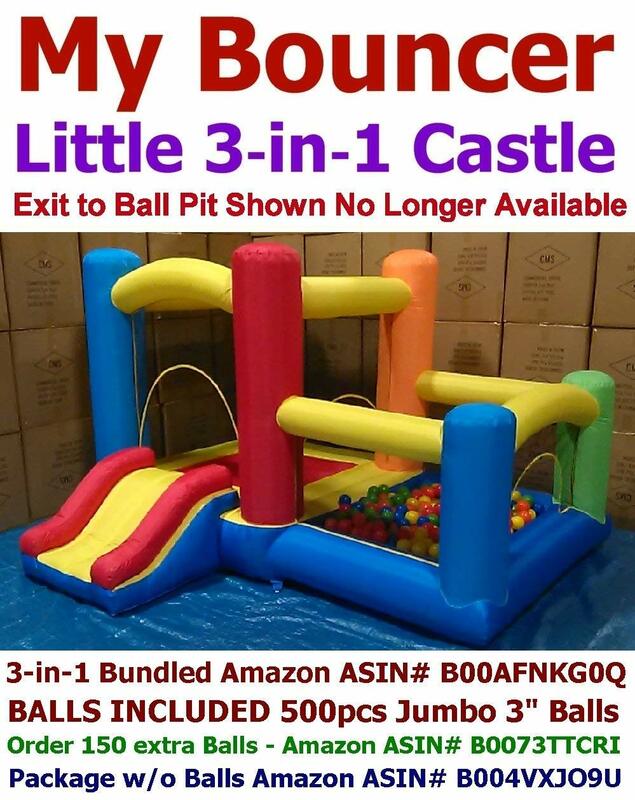 This Bouncational Bouncer also includes 50 Multi-colored play balls that make each bounce that much more fun. The mesh walls create a safety net for young bouncers by containing any possible, these walls also give parents visibility at all times. Additionally, a single, non-removable door allows kids to enter and exit quickly without tripping or falling – while helping to develop motor skills. The built-in pump also provides the benefit of auto deflation, so you can quickly pack up after parties or events. 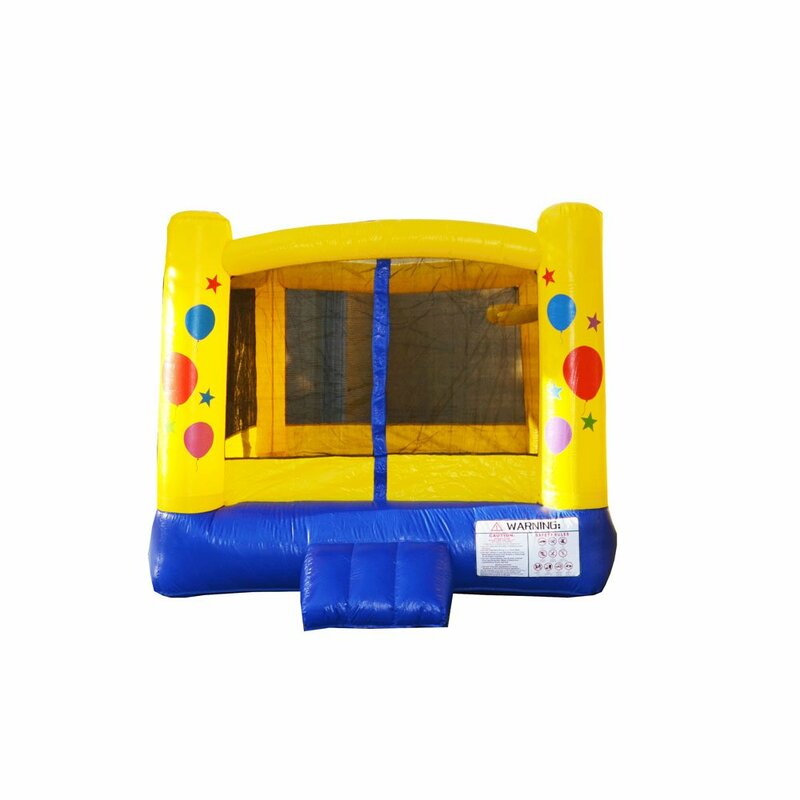 Bounce House Inflatable Slide Castle Jumping Moonwalk. 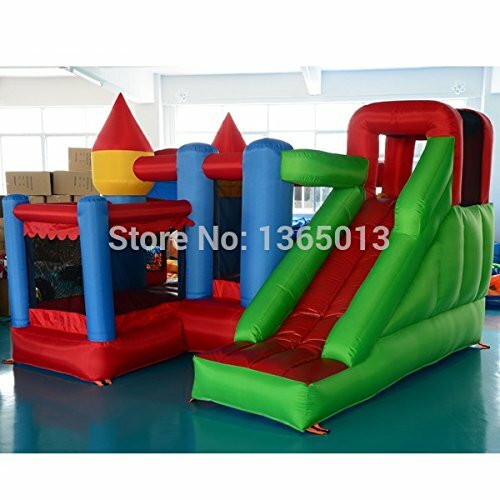 Why Choose Art To Real Inflatable Bounce House with Dual Slide? – Safety & Eco-friendly Material: Approved by UL, CE, EN14960, ASTM F963 and HR4040. – Durable 420D polyester coated PVC and PVC tarpaulin bouncing floor for extra durablity. – Waterproof, puncture-proof and fire-resistand. – Quickly Inflate and deflate: Equiped with blower, easy to set up and take down within 2-3 minutes. When not use, can be take down to save room and easy to storage. – Happied and safety fir kids play. – Colos: Refer to the pictures. – Far Away From Fire. – Do nont using under a bad weather. Like storm, strong wind or other extrem weather. – Adult supervisions is required at all times. – Air leakage from seams and joints is normal. Do not try to stop it. Includes Blower, Carrying Case, and Ground Stakes. A Massive, Magical Monstrosity. 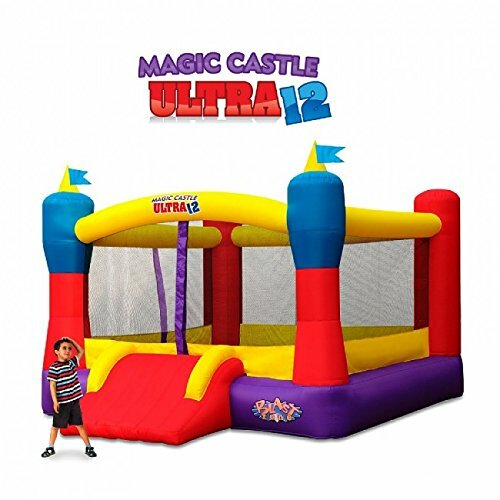 The Magic Castle Ultra 12 is an enormous bouncing castle, the likes of which are rarely seen outside the realm of fairy tales. 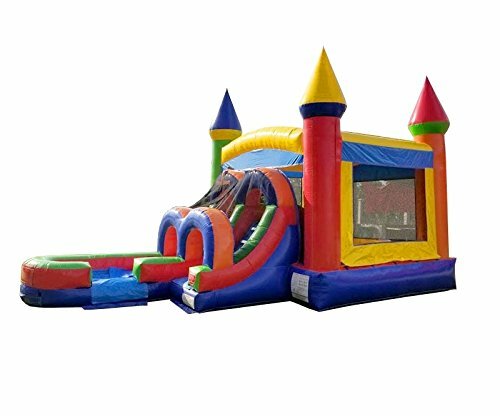 This gigantic jumper will amaze youngsters, and keep your hordes occupied for hours.The Magic Castle Ultra 12 inflates in seconds and holds up to 6 kids, thanks to the huge 12″ x 12″ bouncer footprint. The double-wide “Safe Slope” Slide provides safe, easy access, while the surrounding netting keeps kids safely bouncing and having a blast. 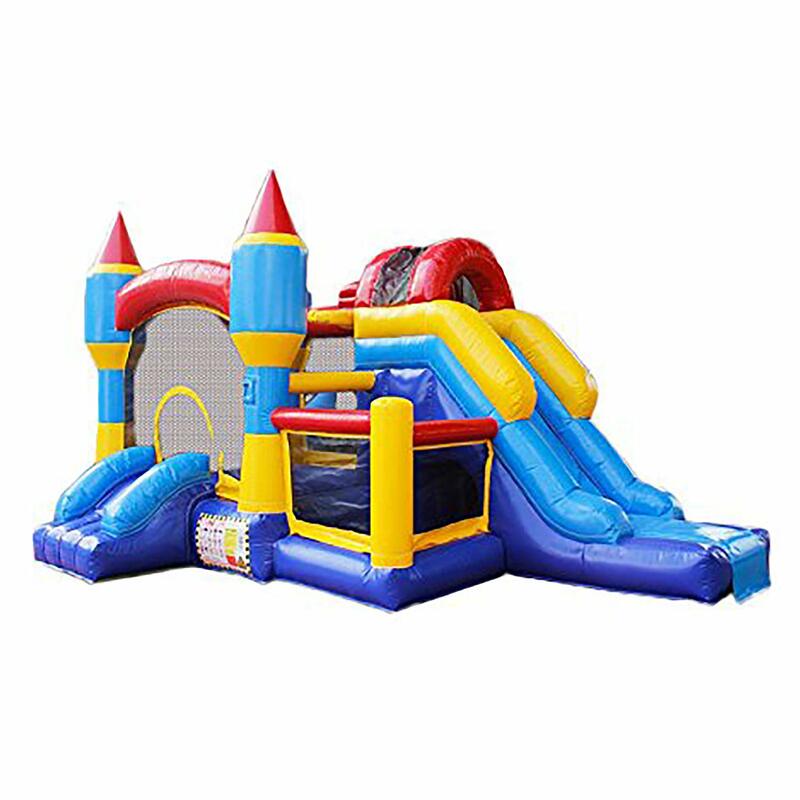 The ultra-durable commercial vinyl floor and reinforced seams add extra bouncing life, and a side-entrance adds additional access.This Blast Zone Bouncy Castle is ideal for backyard play dates, and can also be used to keep kids active indoors (with ample space and optional sand bags). 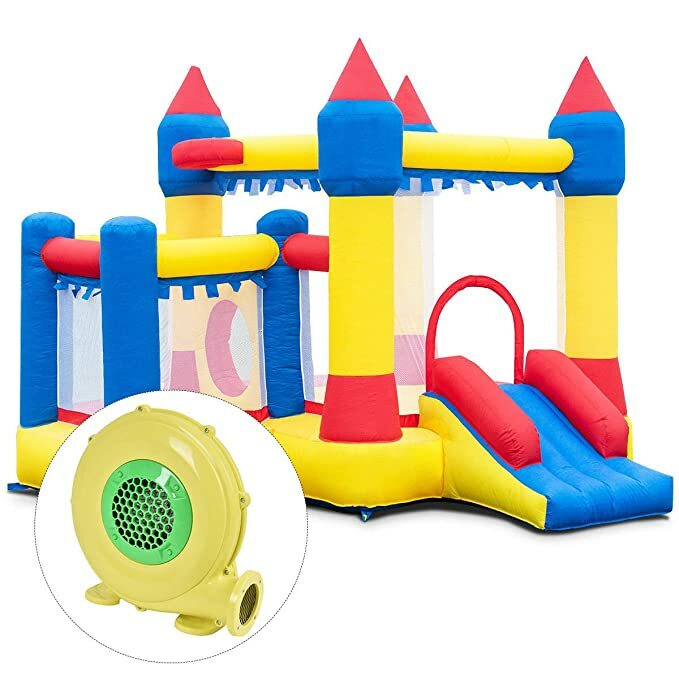 The blower supplies air continuously to the unit, while kids bounce on a pillow of air, safely enclosed by netting at all times.Why Kids love the Magic CastleEvery little prince or princess loves bouncing around in their own bouncy castle. The Magic Castle by Blast Zone is so easy to set up that mom, dad, grandma, or grandpa can set it up in seconds, whenever they want to play.Why Adults love the Magic CastleThis bouncer is simple to set up, store and transport. 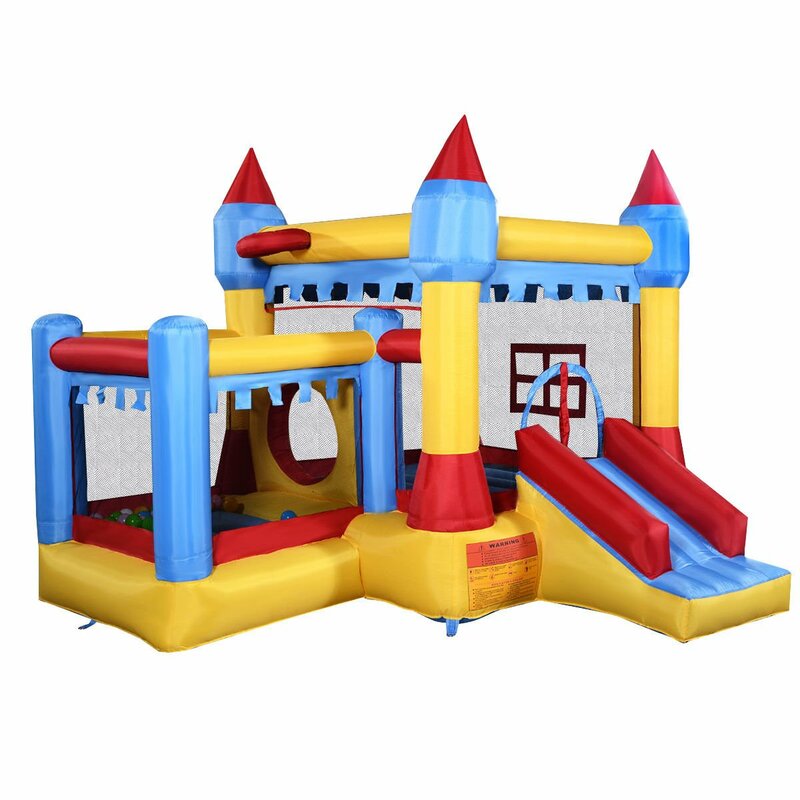 Blast Zone uses exclusive, high-tensile materials to craft the Magic Castle, making it strong and lightweight at the same time. 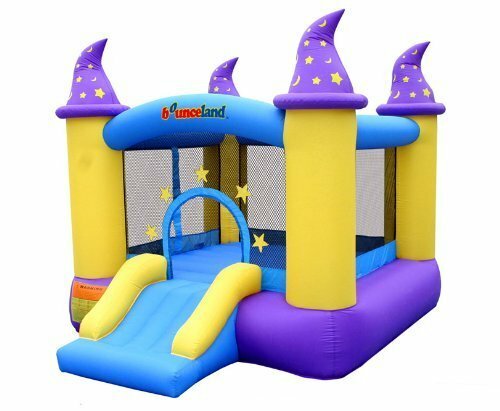 Unlike most store-bought moonwalks, the double stitching and special material in the Magic Castle are designed to stand the rigors of time. Keep your kids playing safely and happily, bouncing away energy, and ready to have prince or princess dreams all night long. 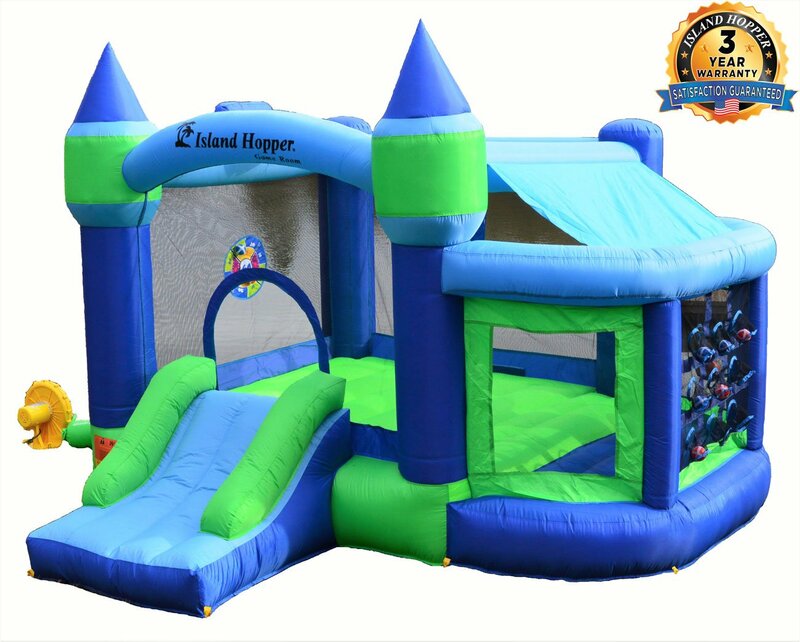 The Island Hopper Curved Double Slide Inflatable Bounce House is the ultimate in bouncing and sliding fun. Your kids will land softly after twisting and turning down this 11′ long inside slide. It’s a home inflatable gym and amusement park all in one. 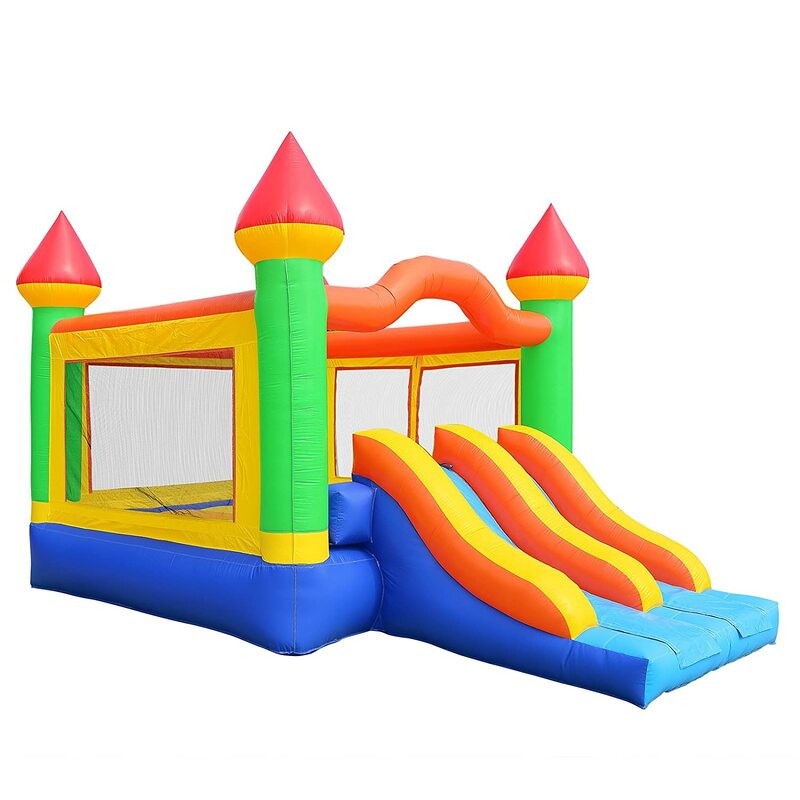 CONVENIENT SIZE: When inflated, this roomy bouncy house measures approximately 13′ front to back including the entry/exit slide, 12′ (wide) x 9′ (tall). SETS UP IN MINUTES: Set-up is quick and easy, inflates in about two minutes and includes everything needed in the box. INCLUDES 950 WATT UL-LISTED BLOWER: Includes a premium-quality UL-Listed bounce house blower with a 950 Watt, 1.3 horsepower constant output to keep your bouncer springy. Features a covered on/off switch and grounded power cord for safety. 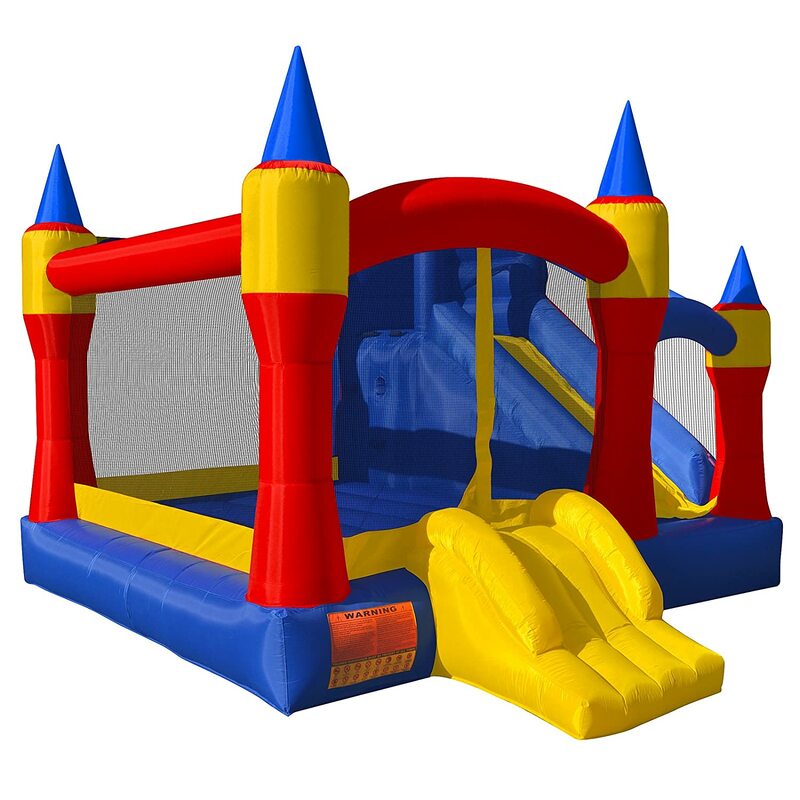 ★Big Size Bounce House: 13.1′ x 12.5′ x 8.2′, with a slide, a bouncing area, four obstacles, a climbing wall, ideal for a birthday party, family reunion, or for any occasion to keep the kids entertained as they bounce around in the moonwalk. 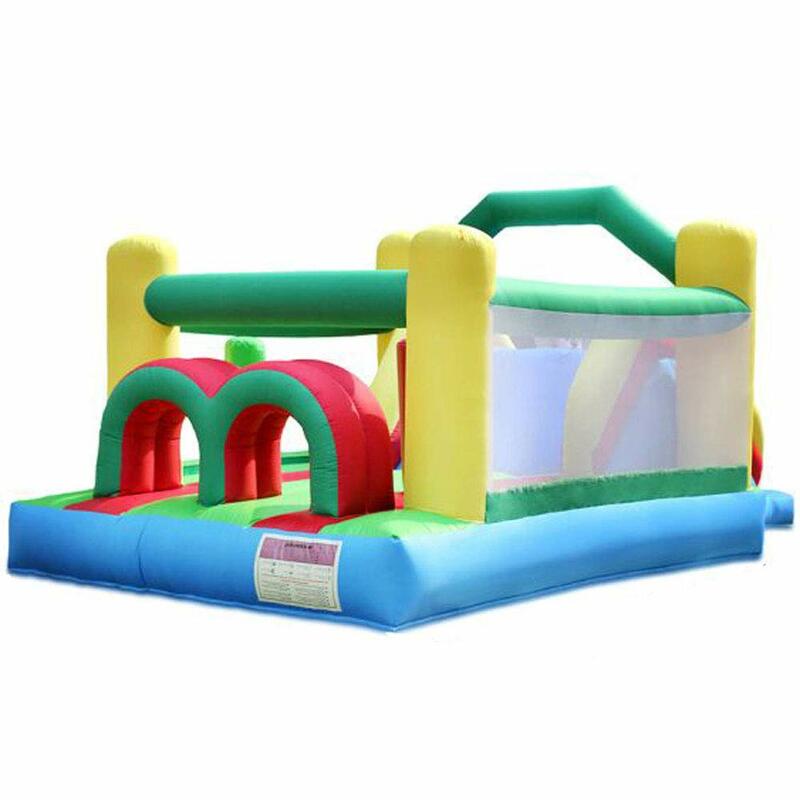 ★YARD Inflatable Bouncer Huge Play Area (10.2 x 7.2 feet) providing large space to accommodate 5-6 children under total 700 pounds. 19.6” height mattress giving enough air pressure, better jumping ability! 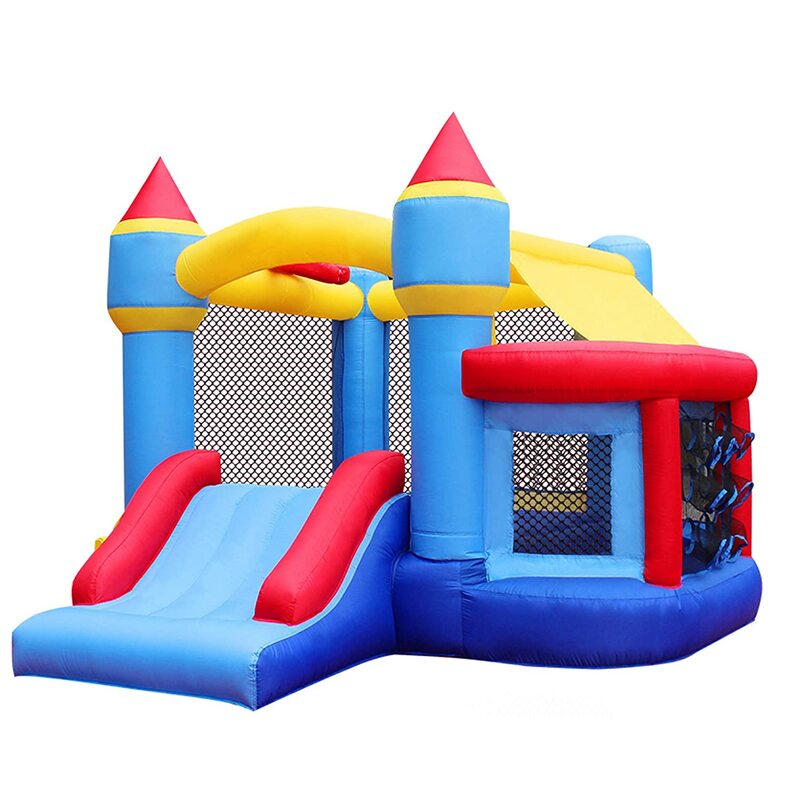 ★Bouncy Castle made of high quality material and made by commercial grade sewing meet requirements of rental at some degree, although it is a residential bounce house. Compared with heavy commercial bouncer, women and kids can move it everywhere freely. ★Designed with safety features and comply with manufacturing laws. Stakes anchor the jump house firmly in ground. Mesh net protect children, your kids will bounce freely on the moonwalk while you take comfort knowing they’re well protected by safety netting. ★Easy installation and quick setup with powerful 660w blower. Easy deflation by air tube and zipper. Maximum portability with storage carry bag included.